It’s been quite a while, and you’ve missed out on a lot of fun things we’ve done this year. Here’s a brief recap! 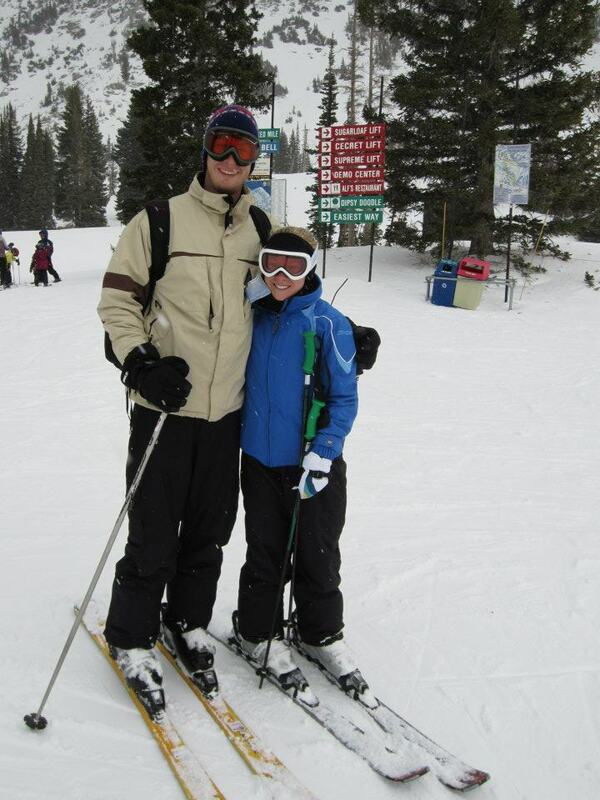 We began the New Year celebrating with the Aguilars in Park City, Utah on the annual Aguilar/Eudsen ski trip! Due to the not-so-great ski conditions at Park City the first two days, we ventured to Alta for some nice fluffy snow! No snowboarders are allowed at Alta, so this put Michael on skis for the first time in 12 years! He picked it back up quickly and we had a blast for the next few days! Shortly after getting back to real life after our extra long vacation, Stephanie came to visit in New Orleans! This was a great mid-week treat for me, as I headed down to NOLA as soon as I could after work on Thursday and rescued Steph from her “stroke” conference! It was great to hang out with Steph and all her doctor friends for the night, and it was my first experience down on Frenchman Street in New Orleans. This is the less touristy (but still very cool) area of the French Quarter where all the bars have live jazz music every night. So much fun! Sadly, I don’t have any pictures from the night! Stephanie’s visit also means that all 3 of my college roommates have been to visit us in Louisiana since we moved just over 2 years ago. I think this means that I have the best roommates everrrr. Come on boys…where are you?!? In late February this year, we got a chance to celebrate Mardi Gras big time! 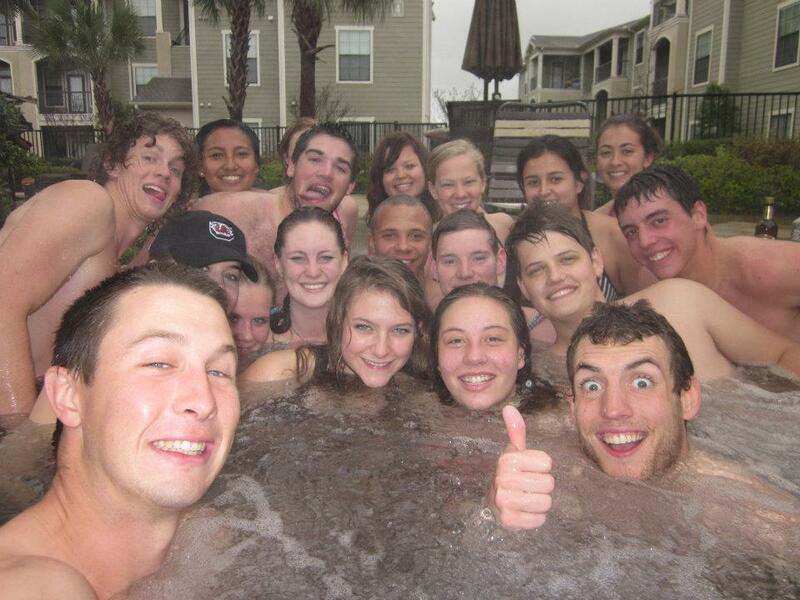 The South Carolina frisbee crew rolled into town (all 17 of them!) for the annual tournament and Mardi Gras celebrations. We spent most of the weekend hot-tubbing, parading, collecting beads, Bourbon Street-ing and eating good food. Due to the weather, not much time was spent playing frisbee, which left so much time for partying! Following this awesome weekend, Michael enjoyed Spring Break Pt. 1 (yes, that’s right…he gets 2!) And the very next weekend, we traveled our separate ways. Michael took his ultimate boys and coached them to a B-bracket championship at Deep Freeze Youth Ultimate Tournament in Chattanooga, TN, while I flew to NC with Tyler to surprise the family and join them on the annual Williamson ski trip! One of the best parts of the trip for me: Kirby’s face as Tyler and I walked into Wendy’s to surprise them after flying into Charlotte. Her face was priceless, and I wish we had been able to capture the moment on camera. 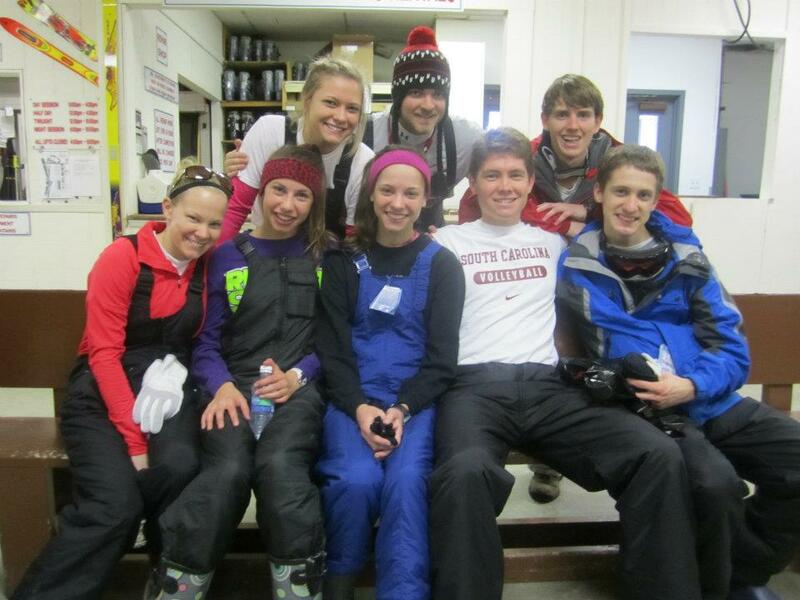 The crew getting ready for day 1 of skiing! 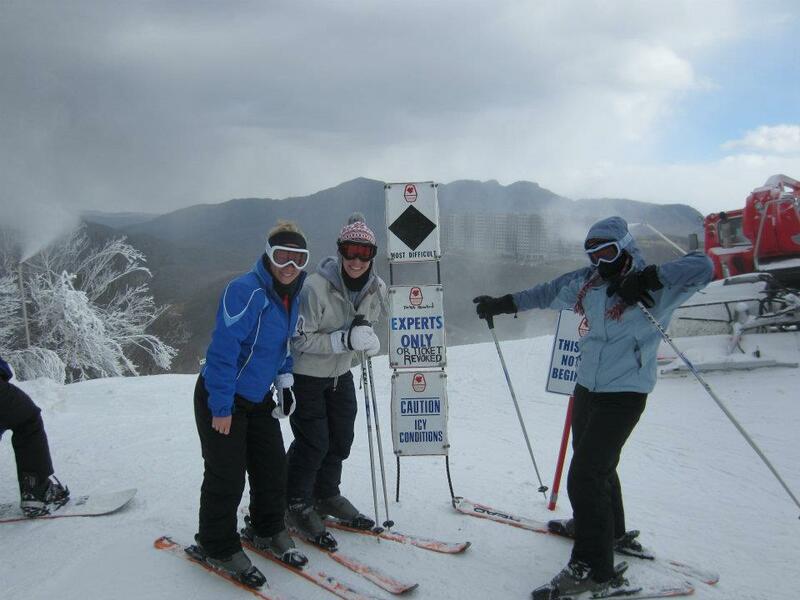 Sisters on top...ready for the black diamond! my favorite picture of the weekend…goofy faces! 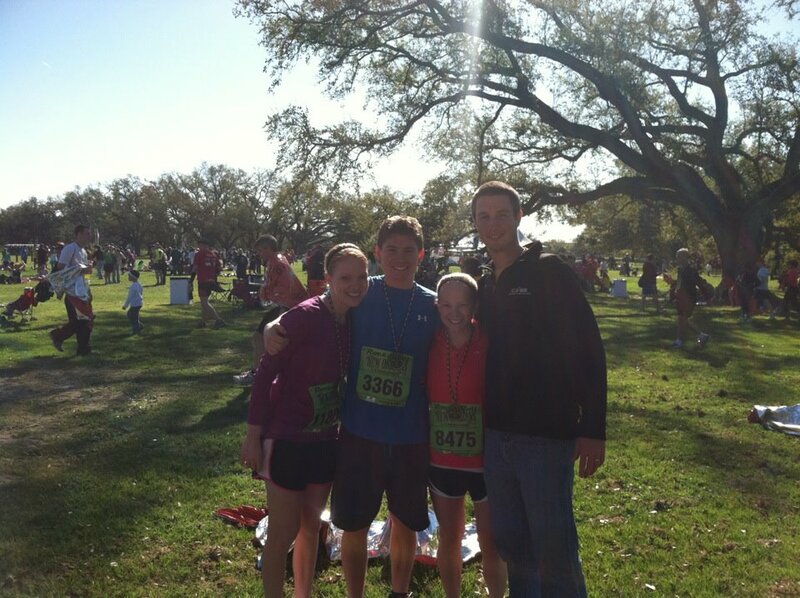 The first weekend in March, Tyler, Carissa and I ran the Rock ‘N Roll Mardi Gras Half Marathon in New Orleans. This was Tyler’s first half marathon and number 2 for Carissa and me. Michael came to support us for the weekend, and we had a blast…even during the race! On Friday night, we went to the Darius Rucker and Lady Antebellum concert, and we spent Saturday touring around the city and checking out the National WWII Museum (so cool and recommended for anyone visiting New Orleans!). Sunday was the big day and we all did great! Tyler finished in 1:36, Carissa finished in 1:55, and I finished in 1:52! Carissa and I were excited to crush our previous times, and Tyler was excited to just dominate in general. Thanks for Michael for coming out to support us!